Ask Me Anything is a collaborative series I’ll be running featuring individuals and families that are facing challenges or are unique in some way. People can ask them anything they’d like to know about their story as long as it’s respectful. Having a family that doesn’t “match” means we attract attention wherever we go. Even living in a diverse area, we still stand out in a crowd. We get a lot of questions and comments when we’re out in public. I’m happy to say that the vast majority are positive. The number one comment I get is, “you have a beautiful family”. Sometimes I feel like this code for “I’m noticing that your family is different”, but I’ll take the compliment. Other comments are not so friendly. People have asked prying questions or made assumptions about my kids’ birth parents. Strangers ask me if any of them are my “real” kids (HINT: they are all very much real). My goal is to openly discuss transracial adoption so people will be more familiar with our situation and other families that look like ours. Following are questions from other bloggers who are familiar with my family but don’t know us in real life. Everyone’s journey is different, but for me, adoption is something I’ve always wanted to do. I’m not sure where the desire came from but it has been on my mind since I was a young teen. Fortunately for me, my husband was open to the idea. It wasn’t a plan that he would have come up with on his own, but we talked about it prior to getting married and he had a lot of time to think it over. We decided together that we would adopt first, before attempting to have biological children. It was also important to us that we pursue adoption for kids that were in need of a family, which is why we chose to adopt from foster care vs. domestic infant adoption. We were not interested in marketing ourselves to birth mothers and being “in competition” with lots of other couples who wanted to adopt. To us, the purpose of adoption is to find families for children, not find a child for the family. Kayla Nigro of Adventures of a Young Mother asks, “What was the process to get your two children? How long did it take? Was it stressful? Because of the route we chose to pursue, the process for us was very quick. First we had to become licensed foster parents, which took a few months. The home study was a little stressful, but being a social worker myself I had a good sense of what they were looking for and didn’t go too crazy alphabetizing my canned goods or anything. Mostly they just want to ensure your home is safe and you have a clean background check. We had to have a room prepared for the child in advance which was a little strange. I think at this stage in the game our friends and family started to think we were crazy. Having never tried to get pregnant and having been married for less than a year, we were collecting any and all baby/toddler items we might need for whatever child we could be placed with. Some people were supportive from the get-go and others tried to talk us out of it. Not having the same support as we had with our biological children is something that still bothers me to this day. On the other hand, there were people that were kind and helpful at this stage and I’m very grateful for them. Adopting from foster care means that there is a good chance you will have some foster placements that end up being reunified with their birth parents or going to relatives instead of becoming available for adoption. This did in fact happen with our first foster baby. While it was extremely difficult for us to care for a child and then see him go, we had faith in the process and believed he was going where he needed to be. That whole situation validated our reason for wanting to adopt prior to having bio kids: we knew that we could endure having a child leave, but we didn’t want any children of ours to have to endure saying goodbye to a child that had been ours for however long. As it turns out, we didn’t have much time to wallow in our grief after saying goodbye to our first foster child. Less than four hours after he left, we were called for Tiana and Zari. Being an adoptive mom has forced me to learn how to be assertive. While the majority of comments I get are positive, I have been asked some that are nosy, strange, or outright rude. Where did you get him? Asked completely out of the blue while grocery shopping with Zari when he was a baby. How much did they cost? This was asked directly in front of my children who were both old enough to understand at the time. What was their mom, a crack whore? Yes, someone asked this exact question. I wish I could say I had a witty response but I literally just stood there speechless. Why didn’t their parents want them? I’m not going to discuss their birth parents and the reasons they are not able to parent. Do they have the same father? Of course they do, my husband is the father of both of them! If you’re asking about their birth father, why on earth does that matter to you? Personally I find it difficult to get snarky with people even when it’s warranted. Usually a blank stare accompanied by silence is enough to make the person think twice about what they just asked. When I’m by myself, questions don’t bother me as much. I feel like it’s something that goes with the territory of being a conspicuous family. I made the choice to have this family so I need to accept what comes with it. The questions that really bother me are when they are offensive and asked in front of my children. They didn’t sign up for this and they don’t appreciate being singled out or made to feel different. I also make a distinction between questions asked out of nosiness vs. people genuinely interested in adoption. I’m happy to engage in a conversation with someone who opens with “I’m interested in adopting, would you be willing to answer some questions for me?” I still won’t disclose personal details that are part of my children’s story, but I will gladly talk about the adoption process in general. I have absolutely found kids to be more tolerant than adults. In almost all cases, children accept our family on first glance without hesitation. In most cases they don’t even seem to notice anything different about us. As the kids have gotten older (they are 7 and 8 now), they occasionally get questions from their peers. Their responses to these questions are as different as their personalities. Zari, always carefree, takes things at face value. Tiana on the other hand is much more aware and concerned about what others think. It’s important to her to fit in and she becomes embarrassed when people ask her about her family. Zari and Tiana were 3 and 4 when our first bio child, Elle, was born. They reacted as any child does when they get a new sibling. They loved the baby and also had typical sibling jealousy. This was especially true for Zari, as he was the one being “de-throned” from his place as the baby of the family. When our fourth child, Luca, came along, I noticed a slightly different reaction. By then they were 6 and 7 and had more questions about pregnancy and where babies come from. This sparked some thoughts about themselves and their birth parents. Tiana especially started asking things like, “why did she have a baby if she couldn’t take care of one?” I tried to field her questions honestly but with as much detail as she could handle and understand at her age. All four of my children behave like regular siblings. They have a normal amount of unconditional love for one another and a normal amount of sibling rivalry. Some combinations of kids get along better than others, but it seems to have more to do with personality type than genetic connection. As for Tiana, she also loves all her siblings the same but I also know it means a lot to her that we have Zari. She is more sensitive to looking “different” and it is helpful for her to have someone in the family that looks like her. I’ve also spoken to adult adoptees who say it was difficult growing up without knowing anyone who is biologically related to them. I think this would be an issue for Tiana based on her personality, so I’m glad she has Zari. Natasha Brown of Grits and Grace asks, “what has been the toughest part for you and your husband raising black children? Learning to do T’s hair took some practice. When the kids were first placed with us, I didn’t give much thought to the idea of raising black children. I figured I would need to learn some basics in haircare, but other than that all children need the same things, right? With time I’ve come to realize that there is more to it than food, shelter, and love. Are my husband and I equipped to raise black adults in our society? The honest answer is, probably not. We can teach them what we want them to know (and we’ve already started), but we have not lived the reality that they are living being black individuals in the U.S. Preparing them for adulthood is a huge responsibility that is not lost on us. I started giving a lot more thought to this topic when Trayvon Martin was killed. When I saw his cute, boyish face all over the news, I watched in horror. I started to think about my cute little boy and how people would see him when he is a tall, strong, young black man. Could he be shot walking home in our neighborhood? The thought terrifies me. John and I know that we are raising our kids with a certain amount of privilege. As young children, Tiana and Zari are afforded some basic white privilege by having white parents. We also know that this is temporary. Once my children are grown and they go out in public without us, the world won’t see what school they went to or what house they grew up in. They will simply be seen as black. People will make judgments and assumptions about them. I’m sure it will be harsh and my kids will likely be unprepared for that. We have began teaching them basic things like how to act around the police and how to conduct themselves in public. Sadly, I have already had to explain to my son that he needs to control his emotions because if he gets angry, people will be afraid. These conversations are difficult but I know they are necessary. John and I also know we can only teach them so much. They will also need some black role models and mentors to help. 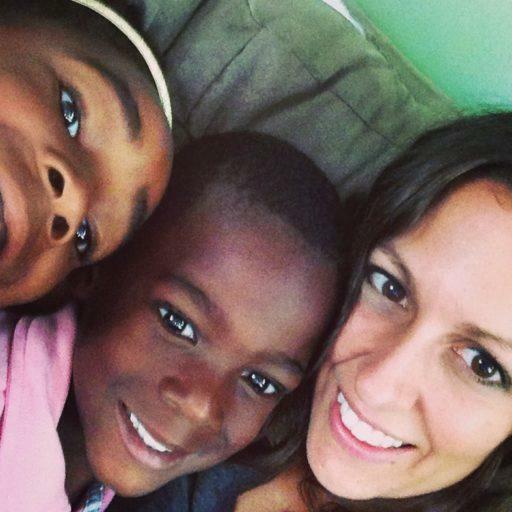 Transracial adoption doesn’t work without help. It isn’t for everyone and it certainly isn’t easy, but transracial adoption has been a wonderful blessing for our family. Want to see more posts about transracial adoption? What other questions do you have? Leave a comment! LOVE this post! I have a friend who works closely with foster children/parents and she has been nudging me to do this for quite sometime. My fear is that I would just get too attached to a child and just be completely heartbroken and/or devastated if they left me for whatever reason. I know I would have to believe in the system too, and things would work out, but I know I’d have a heavy weight on my shoulders worrying for that child everyday. How did you handle this with your first foster child? Do you still stay in touch? Thanks for reading Christine, and I will try to tackle your questions. As a foster parent, you will be heartbroken when a child leaves. If it were easy to let go, it means you weren’t attached and probably not a good foster parent, right? What helps is remembering why you’re doing it in the first place. A child needs a safe place to land and they need that more than we need to not be sad when they leave. As the foster parent, your role is to be their safety net during an extremely difficult time in their lives, and to show them what a healthy family looks like. Whether you do that for them for two days or two years, you’ve done your part for that child. It was hard to let go of our first foster child, but I never worried for him or his safety. Often times foster parents are able to meet the family that the child is going to, and this helps tremendously. I absolutely love this! Thank you for answering my question! No lie it brought tears to my eyes! What a beautiful and thoughtful post. I can imagine that you’ll be answering these questions for years to come. I love that you acknowledge that your children will need black role models and will make that available to them. You’re rocking this! Caitlin, this was beautiful! Your honesty answering Natasha’s question brought me to tears. This post is truly inspirational. Thank you. I loved learning more about the process and how your beautiful family has come together. I can’t believe some of the questions people have asked you though! So rude. I really appreciated your honesty. I also can’t believe how straightforward some people have been about your children. I really enjoyed reading how you handle some of the situations you’ve come across. Thank you for sharing ! This was such an eye-opening post and I love your transparency. It sounds like you are doing an awesome job raising your children and teaching them everything you can so they’re prepared as adults. They’re very lucky to have you. Did those who were initially skeptical of your decision to adopt initially come around? Do you know family members treat Tiana and Zari the same as your bio kids? Thank you for your kind words, Krista! I am happy to say that all of our family members fell in love with the kids once they met them. I think it was just scary for them to see us go down a path that is “unknown”, but now our adopted kiddos are just as loved and accepted as the rest. Thanks for sharing your story. You family has a strong foundation. The children, all of them will be fine. The best part is you are aware of what is out there and that’s the best thing you can do for your children. Living in a bubble does not help.